These Caramel & Macadamia Chocolate Cups will be sure to impress your guests. Gluten, dairy and refined sugar free!! So good! Christmas would not be the same without chocolate! Whether it is given as a gift or included as part of the days’ menu, there is no denying its importance on Christmas Day and during the festive season. However many of the store bought varieties are full of nasty additives, preservatives and way too much sugar. Since starting Becomingness, I have shared many healthy chocolate recipes which will provide you with lots of healthy chocolate options for Christmas. My latest chocolate recipe, Caramel & Macadamia Chocolate Cups is no exception and will be sure to impress your guests. To make the caramel filling, place all filling ingredients in a high speed blender and process until completely combined and smooth. You may need to add a little more water to help blend the ingredients. 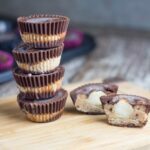 To make the caramel & macadamia chocolate cups, place 1 teaspoon of the chocolate mixture into each mini muffin liner and swirl around to coat the sides, place the liner into the mini muffin tray. Place in freezer for 10 minutes to set. Once the chocolate has set, spoon the caramel filling into each one and place one of the macadamias into and lightly press down. Then cover with more of the chocolate mixture and place in the freezer for at least 2 hours to set. The cook time does not include the time it takes for these caramel & macadamia cups to set in the freezer.